The inaugural S-D Logic award was made to Evert Gummesson, Emeritus Professor, Stockholm University School of Business, Sweden. 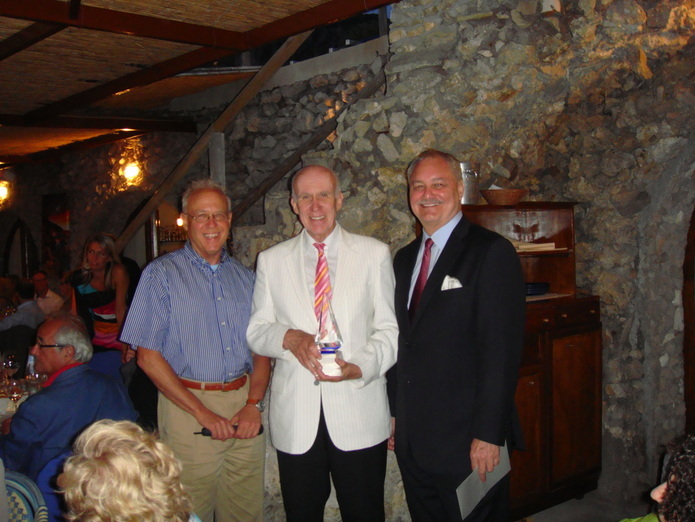 The award was presented at the Naples Forum in June of 2011. Evert Gummesson is Emeritus Professor of Marketing and Management at the Stockholm University School of Business, Sweden, and its former Research Director. He graduated from the Stockholm School of Economics, received his Ph.D. in management from Stockholm University, is a fellow and Honorary Doctor of Hanken School of Economics, Helsinki, and is a fellow of the University of Tampere, both in Finland. He is an international pioneer in the fields of marketing, service, relationships and qualitative methodology, currently with special focus on many-to-many marketing and network theory. In 1977 he wrote the first book on services to be published in Scandinavia;he has been featured in the Journal of Retailing as one of the international pioneers of services marketing; and is among the ten pioneers in services selected for a book from the American Marketing Association (AMA). In 2000 he received the AMA Career Contributions to Services Discipline Award (now named the Christopher Lovelock Career Contributions Award). In 2011 he became the first recipient of the Grönroos Service Research Award for “…excellent achievements in service research challenging common understanding and demonstrating significant originality”, established by the Hanken School of Economics; the first recipient of the S-D Logic Award for ”Pioneering and Continuing Achievement”; and the Naples Forum on Service established the Evert Gummesson Outstanding Research Award to be given to scholars who have contributed with innovative and sustainable service research. He is one of the 50 most important contributors to the development of marketing included in the guru list of the Chartered Institute of Marketing (CIM), UK. He has written or contributed to more than 50 books in 10 languages and published numerous articles in, for example, theEuropean Journal of Marketing, Journal of Marketing, Journal of the Academy of Marketing Science, Marketing Theory, Journal or Service Research, and Journal of Service Management. In 2005 his article (with Christopher Lovelock), “Whither Services Marketing” in the Journal of Service Research, became the winner of the AMA Best Services Article Award. His book Total Relationship Marketing (3rd revised edition in 2008) has won the award Marketing Book of the Year by the Swedish Marketing Federation and the Chris Ottander Prize for “…seminal contributions in marketing communications and relationship marketing.” His current research is focused on the next step in service and marketing and his conclusion is that we will have to address more complex relationships as they become networks and systems. His 2004 book Many-to-Many Marketing(published in Swedish, Finnish and Norwegian), became one of three Marketing Books of the Year appointed by the Swedish Marketing Federation, and he became The 2004 Profile in Sales and Marketing appointed by KompetensGruppen and Svenska Konsulthuset. Dr. Gummesson takes a special interest in research methodology and the theory of science. It embraces the research practices ofacademics, consultants and companies, particularly addressing theproblems of real world complexity. He first published his bookQualitative Methods in Management Research in 1985, and the English version (SAGE) has been reprinted and revised several times. He has written some 15 articles and book chapters on theory and methodology and is currently writing a book, Case Study Research in Management and Business, to be published by SAGE in 2012. In cooperation with the co-creator of grounded theory Barney Glaser he has been involved in grounded theory applications to management and business since the 1980s, and he contributes with a chapter in a book on grounded theory to be published in 2011. Dr. Gummesson also takes a general interest in how knowledge is developed and applied in other sciences, and is especially critical to the way it is developing in medicine and economics. He is a co-founder of the Service Research Center (CTF), Karlstad University, Sweden, and the series of international Quality in Services conferences, QUIS. He was a founding director of ISQA, The International Service Quality Association, New York; is an elected fellow of the World Academy of Productivity Science; and was for many years a member of the Scientific Board of SIQ, the Swedish Institute of Quality, who handles the Swedish National Quality Award. To support new thinking in service and marketing he co-founded and co-chaired the 2009 and 2011 Naples Forum on Service, Capri, Italy, dedicated to service-dominant logic, service science, and many-to-many network marketing. He is a current or former member of several editorial boards, among them European Journal of Marketing, Journal of the Academy of Marketing Science, Journal of Business-to-Business Marketing, Journal of Service Management, Journal of Service Research, Marketing Theory, and Qualitative Research in Organizations and Management. He has twenty-five years of experience from business, among other positions as product and marketing manager at the Reader's Digest Swedish subsidiary. From 1968 to 1982 he was employed by PA Consulting Group, on of the largest management consultancies in Europe, where he became senior management consultant and a director in the Scandinavian Division. Among his clients have been Ericsson, IBM, MasterCard, the Swedish Cooperative Union, Swedish Railroads, Swedish Telecom, and the United Nations. He is a frequent speaker at conferences, companies, executive education programs and universities throughout the world.Examples are Ericsson; TNC; IBM; Norwegian Center for Service Research; Ambrosetti, Italy; Academy of Marketing, Dublin; Frauenhofer, Germany; American Marketing Association, USA; the Ministry of Innovation, UK; and Cambridge University, UK.